and choose Amazon.com and not a third-party seller. Become a machine learning expert. Step up your career. Today’s top companies undergo the most significant transformation since industrialization. Artificial Intelligence disrupts industries, the way we work, think, interact. Gartner predicts that by 2020 AI will create 2.3 million jobs, while eliminating 1.8 million. Machine Learning is what drives AI. Experts in this domain are rare, employers fight for the ML-skilled talent. 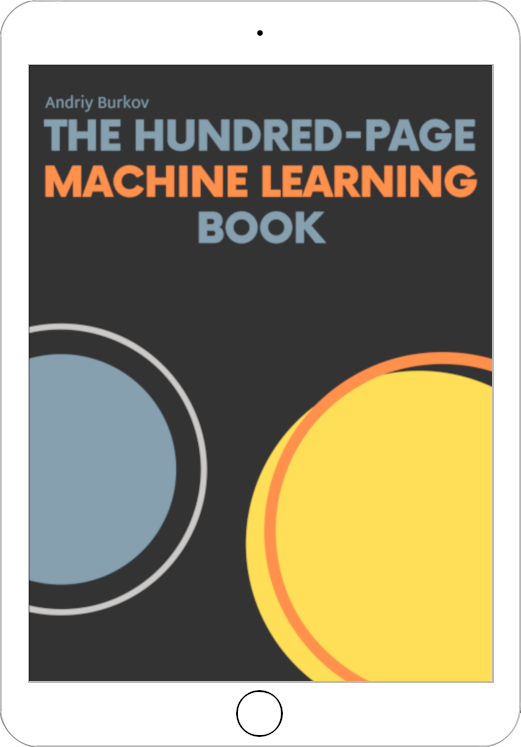 With this book, you will learn how Machine Learning works. A hundred pages from now, you will be ready to build complex AI systems, pass an interview or start your own business. Supervised and unsupervised learning, support vector machines, neural networks, ensemble methods, gradient descent, cluster analysis and dimensionality reduction, autoencoders and transfer learning, feature engineering and hyperparameter tuning! Math, intuition, illustrations, all in just a hundred pages! "A wonderful book for engineers who want to incorporate ML in their day-to-day work without spending an enormous amount of time." "A great introduction to machine learning from a world-class practitioner and LinkedIn superstar Andriy Burkov." 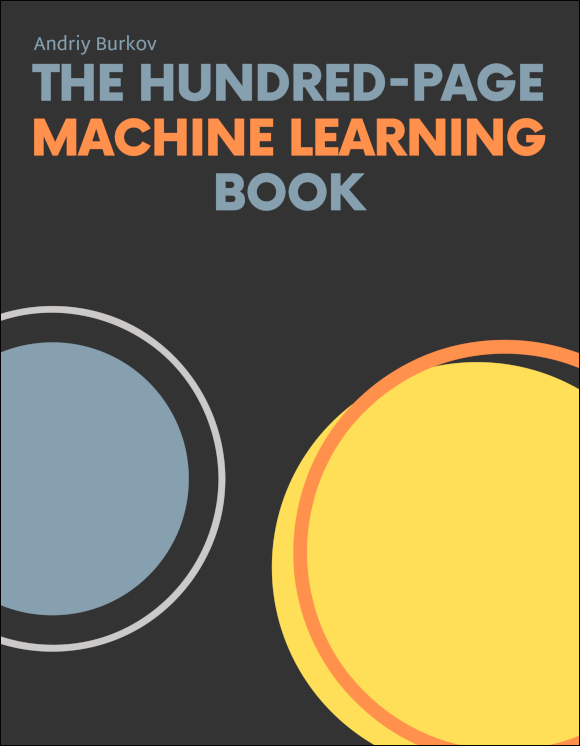 "I wish such a book existed when I was a statistics graduate student trying to learn about machine learning." "Andriy's book does a fantastic job of cutting the noise and hitting the tracks and full speed from the first page." "I cannot recommend this enough, especially when you can try the book for free." 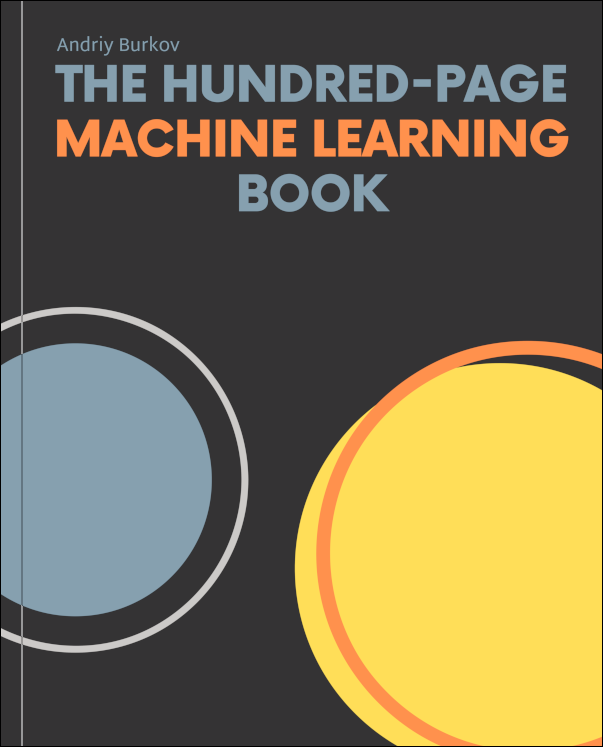 "hands down the book you need to grok and master machine learning concepts"
"Andriy Burkov has written a masterpiece." 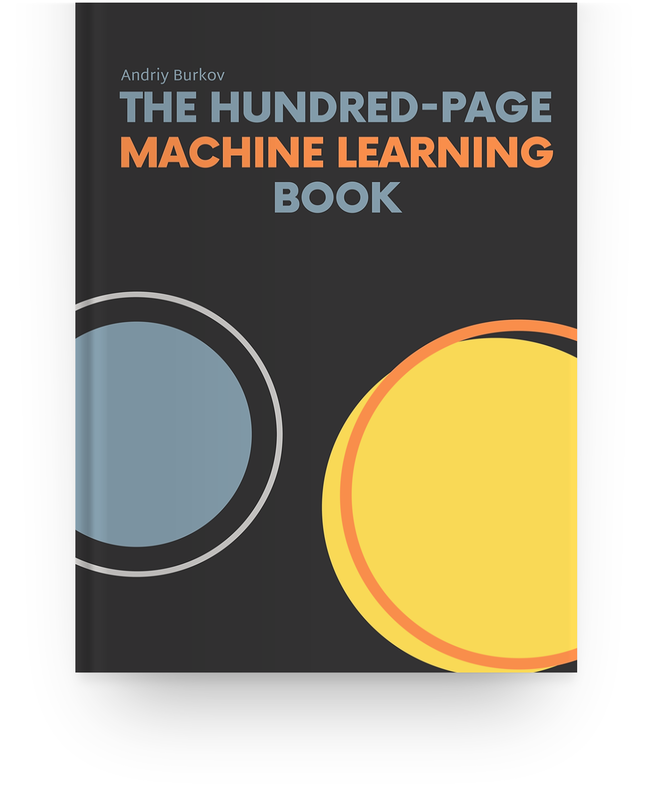 "a concise yet very useful resource"
"very precise and well written"
"If you only get one book on machine learning this year, here is the one you need to read." "Covers a lot of depth but still very concise and readable." "this book kicks you in the right direction"
"It's an excellent book for both starters and professionals. Highly recommended." "Straight to the point, backed by equations. Loving it and I would recommend it to other ML enthusiasts." concise and to the point — the book can be read during a week. During that week, you will learn almost everything the modern machine learning has to offer. The author and other practitioners have spent years learning these concepts. companion wiki — the book has a continuously updated wiki that extends some book chapters with additional information: Q&A, code snippets, further reading, tools, and other relevant resources. flexible price and formats — choose from a variety of formats and price options: Kindle, hardcover, paperback, EPUB, PDF. If you buy an EPUB or a PDF, you decide the price you pay! read first, buy later — download book chapters for free, read them and share with your friends and colleagues. Only if you liked the book or found it useful in your work, study or business, then buy it. Hey! My name is Andriy. 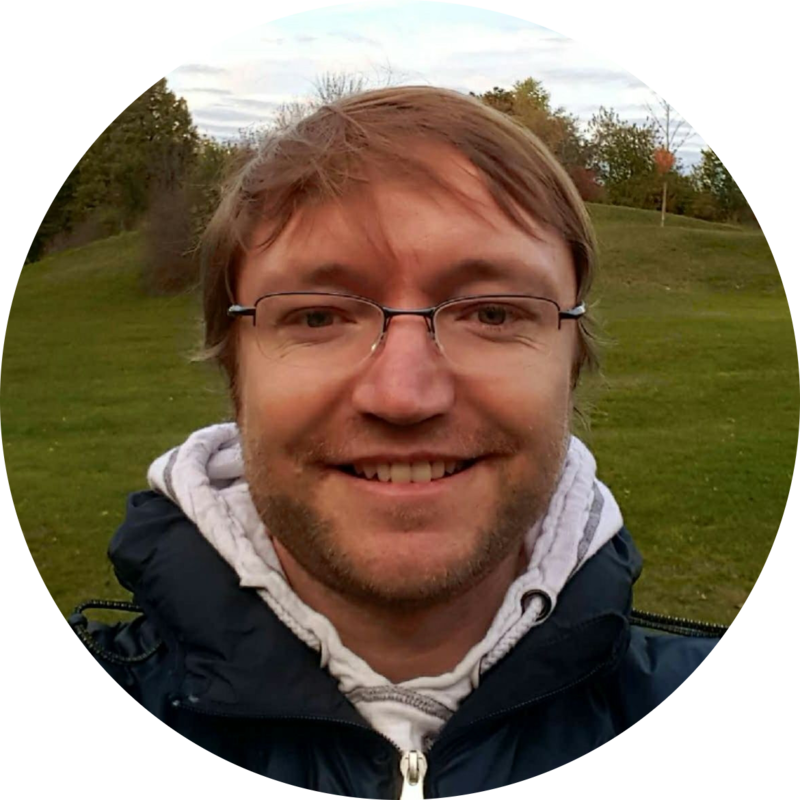 I'm a dad of two and a machine learning expert based in Quebec City, Canada. Nine years ago, I got a Ph.D. in Artificial Intelligence, and for the last seven years, I've been leading a team of machine learning developers at Gartner. My specialty is natural language processing. My team works on building state-of-the-art multilingual text extraction and normalization systems for production, using both shallow and deep learning technologies. Reach me on LinkedIn, Twitter or email. I occasionally send interesting materials related to my book and machine learning in general. Subscribe if you are interested. WARNING! To avoid buying counterfeit on Amazon, click on See All Buying Options and choose Amazon.com and not a third-party seller. When you buy a hard copy, you can request a free PDF copy. Is it true that some people sell counterfeit copies of your book? Unfortunately, yes. Even on Amazon.com, some third-party sellers sell counterfeit copies. To avoid buying counterfeit, click here and choose amazon.com as the seller. How much time will it take me to read this book? The book has 140 pages. With enough dedication it could be read in a single sitting or during a weekend. On average, people spend a week of after-work reading. Do you have a money back guarantee policy? Within 45 days of purchase you can get a 100% refund on any e-book purchase on Leanpub. Do you have a discount for students? If you are a student, I recommend you to buy an e-book on Leanpub for the minimum price, which is $20. If you feel like it's still too expensive for you, send me an email and we will figure something out. Do you have a bulk pricing? Yes. If you need more than three copies of the book for your R&D team, students or event attendees send me an email and I will offer you a bulk price. I don't need a copy of the book but would like to thank the author. Can I donate? There are no donations, but you can buy a soft copy on Leanpub for any price above $20 and then give that soft copy to a friend. Send an email to author@themlbook.com and also check this my AMA on Reddit.